WATERLOO — Vyla Blough, 100, of Waterloo, died Saturday, Dec. 1, 2012, at Friendship Village Retirement Center of natural causes. 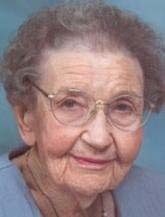 She was born March 17, 1912, in Preston, Minn., daughter of Jake and Jessie Broadwater Tammel. She married Edgar Blough on May 24, 1942, at Root River Brethren Church, Preston. He died Sept. 16, 2001. Mrs. Blough graduated from high school and attended one year of college at John Fletcher Academy, University Park. Continuing her education, she attended Normal School Teacher’s Training, Preston. She taught school in rural Minnesota for seven years. Later she and her husband farmed in Orange Township. She was a member of South Waterloo Church of the Brethren where she had been financial secretary for a number of years, taught Sunday School and was a member of Women’s Fellowship. For many years she was the Orange Township correspondent for the Hudson Herald. She also was a 4-H leader. Survived by a son, Richard (Susan) of Waterloo; two daughters, Shirley (Richard) Miller of Taylor, Wis., and Sharon Blough of Waterloo; three grandchildren, Rachelle (Matt Kutz) Miller of Madison, Wis., Angela (Mike) Headlee of Bemidji, Minn., and Joshua (Rachel) Blough of Waterloo; five great-grandchildren, Owen and Eliott Kutz, and Zoey, Paige and Daniel Headlee; a sister, Gayle Hodgson of Waterloo; a brother, Juan (Lois) Tammel of Harmony, Minn.; and a sister-in-law, Marilyn Tammel of Harmony, Minn.
Preceded in death by a granddaughter, Tanna Sue Blough; two brothers, Dwight and Donne Tammel; and a sister, Marjorie Wissing. Services: 11 a.m. Thursday at South Waterloo Church of the Brethren, preceded by family burial in Orange Township Cemetery. Visitation from 4 to 7 p.m. Wednesday at Locke Funeral Home. Memorials may be directed to the church or Friendship Village Auxiliary. Vyla’s pies and canned goods won numerous blue ribbon awards at the Cattle Congress.